So what do we do? Where do we stand within Scripture in order to interpret the rest of the text? Genesis? Leviticus? Joshua? Revelation? What we need is a way to center our reading of Scripture – a vantage point from which to interpret the whole of Scripture. My humble suggestion is that this place is the cross. Not only do I advocate a Christocentric reading of the Bible, I contend that the cross is the most Christ-revealing moment in the Bible. If we want to know what God is like, the best thing we can do is look at Jesus upon the cross. God is like that! God is defined in Christ at the cross. But the cross is a labyrinth of sacred mystery and we must not be too quick to glibly assert “this is what the cross means.” This is the seductive allure of “atonement theories.” Some of these theories I find inadequate, some I find repellent. Especially those theories that portray the Father of Jesus as a pagan deity who can only be placated by child sacrifice. The scorn heaped upon such theories of the cross is well-deserved. On the cross Jesus took the blame to save us from blaming. On the cross Jesus shamed the principalities and powers of sacrificial religion and violent power (represented by Caiaphas and Pilate). Through the cross Jesus judges sin, casts out satan, and re-founds the world. In the cross of Christ the world is re-founded from an axis of power enforced by violence to an axis of love expressed in forgiveness. In his crucifixion Jesus achieves solidarity with all who suffer. The cross is the only Christian theodicy. The cross is the coronation of the world’s rightful King. In his crucifixion Jesus joins humanity in death that we might join him in resurrection. In his crucifixion Jesus tramples down death by death. Though his death on the cross Jesus descended into Sheol/Hades that he might open the door to eternal life. In his death and resurrection Jesus inaugurates the world to come – the world of New Creation. I’m not interesting in bottling up the cross in a single atonement theory. What I want to do is gaze upon the mysterious beauty of the cruciform until I see the beauty of God take the form of a crucified man. I approach the cross not to find a quid pro quo formula for salvation, but to contemplate the divine love of God which is my only hope of salvation. 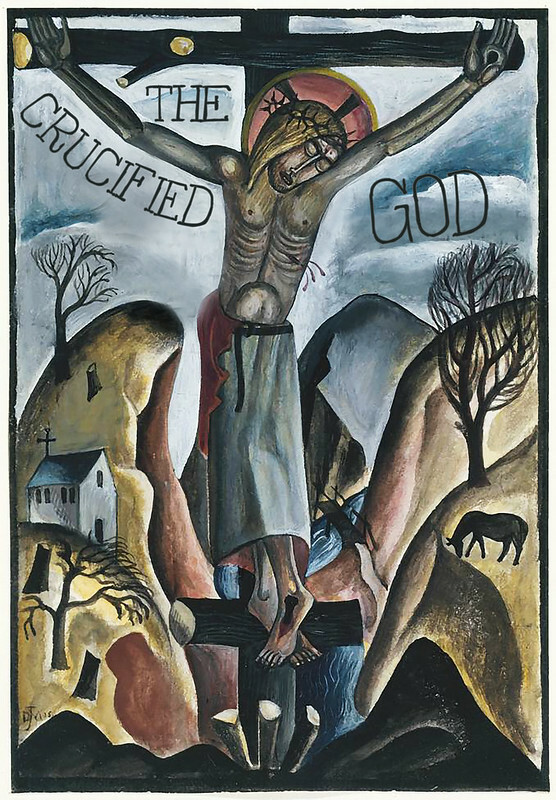 I gaze upon the crucified Christ because this is who God is, this is what God is like. I look to the cross to see God. I don’t come to the cross to find a formula or a theory. I come to the cross to find God.